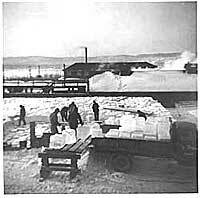 In Capreol, from the 1910's to the 40's, cutting ice for the "ice box" was a booming business. Ice blocks of various sizes were cut in the winter and stored in ice houses for use in the summer months. The ice was covered in hardwood sawdust which seemed to hold the cold better than softwood sawdust. Ice was taken from Ella Lake and the Vermilion River in the winter months. Most of the time the temperature would fall below -40 in our area. When the ice was too thick to harvest on Ella Lake, it was found that ice on the Vermilion River was much easier to handle. Moving water kept the ice from getting too thick. 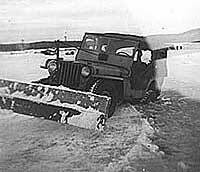 A Willy's jeep was used to plough the snow off the ice. Alex McLeish drove his jeep a little too close to the edge of the water and almost lost it in the Vermillion River. After the snow was removed, the five foot saw blade was hauled in to start cutting the ice. The blade would cut ice up to two and a half feet thick. A channel was cut so that the ice could be pike polled along until it reached a gas operated conveyor belt. 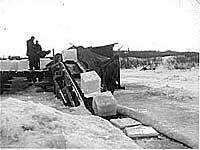 The blocks of ice would then be loaded in a flat bed truck and delivered to the ice house. The CNR was the main buyer of the ice which was used to keep food and beverages cold while they travelled across Canada by rail. The rest of the ice was used to supply Capreol residents with all their cooling needs. Before trucks were used, many horses met their demise in the icy waters of the Vermillion River. When a horse broke through the ice, the men would try to pull it out with ropes. If the horse tired before the rescue was made, it's chances of getting out were not good. Many horses could not escape from their icy fate and were shot to end their suffering. Trucks, on the other hand, could be caught with a hook on a rope and pulled out in the following summer. Some of the men from Capreol who cut ice were, Alex Nepitt, Joe Hanzel, George Deavy, Joe Valley and James Coyne. The next time you open your refrigerator to get a cold drink, think about how they cut ice in Capreol in the the old days.